Ahmedabad: Cotton harvest in India’s main producing states have started well with periodic rainfall and abundant sunlight, raising prospects for a second consecutive record crop, traders said. Output is likely to reach 33 million bales in the crop year to September 2008—up from a record 27 million bales a year earlier, helped by more area under cultivation, good weather and extensive use of transgenic seeds. One bale of cotton is equivalent to 170 kg. “The crop looks excellent and harvesting has begun very well," Rakesh Rathi, president of Northern India Cotton Association, said on Monday. Traders said harvest has begun in Gujarat, Maharashtra and Punjab. India, the world’s third largest cotton producer after China and the US, is on course for a record crop but rains during harvest could skew those predictions, said Abhay Rawal, an agriculture ministry official in Gujarat, India’s largest cotton producing state. The land under cotton has increased to around 9.9 million ha from 9.2 million ha, according to the ministry. India’s cotton crop, prone to pest attacks like bollworm, has remained largely free of damage this year because of more use of pest-resistant genetically modified cotton. In 2002, India allowed transgenic cotton, which contains a gene from Bacillus thuringiensis—a species of bacterium. Bacillus thuringiensis causes lethal paralysis in the digestive tract of bollworm and makes them harmless. 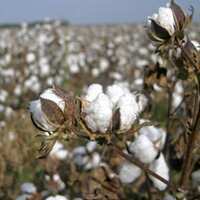 Farmers in Gujarat, Maharashtra and Punjab have opted for large plantings of Bt cotton this year. Transgenic seeds have been a favourite among farmers, said Saurabh Sinha, an agro-scientist based in Mumbai, the business and trading hub of India. With underground water levels depleting, scattered rainfall, high humidity and transgenic seeds available at cheaper prices, Bt cotton is a good and less risky option for Indian farmers because it cuts the use of pesticides, Sinha said. Record production has brightened the prospects of cotton exports from India and traders said the country could sell more than 6 million bales during the 2007-08 crop year— up nearly 20% from the earlier year. “Indian cotton prices are competitive, and acceptability of our Bt cotton is increasing rapidly in the world markets," a trader said.